As we are just over a month away from the release of the Marvel Cinematic Universe’s Phase 3 Finale, and arguably the most anticipated film of all time, Avengers: Endgame, everyone is looking for any details they can find about the film’s secretive plot. Marvel Studios is down to slowly leak information out about the blockbuster, but the film’s usual collection of promos and toys are doing much the same. So, if you see fans freaking out about Captain America, you should know they’ve got reason to. One of the biggest avenues for Avengers: Endgame “secrets spoilers” has been toy leaks. These leaks hit the internet, and speculation runs rampant like a raging waterfall. This latest leak is no exception. Over on Reddit, a new look at a Captain America action figure has fans in a bit of a frenzy. Looking at the figure closely, you can see a very particular helmet used which lends to the time travel theory. The helmet is the same one Cap wore during the Battle of New York in 2012’s Avengers film. As you can see below, the figure in question has Steve Rogers in a new uniform. The outfit is known as the Quantum Realm suit which hints that Captain America in Avengers Endgame may time travel, as fans lovingly dubbed the high-tech costume awhile back. However, if you check out the figure’s headgear, you will notice it is identical to the helmet he wore back in 2012’s The Avengers. This throwback has got fans feeling plenty curious as the MCU is known to update costumes rather than regress them. The fact that Captain America is seen in an old helmet raises some tricky time-travel questions, and the poster stresses this leaked image is the real deal. Is Captain America figure teasing his time travel plans? 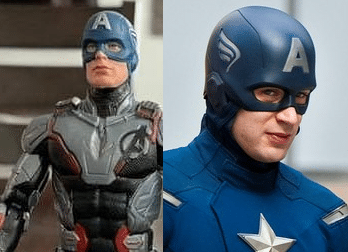 The mismatched figure has got fans speculating whether the Avengers: Endgame’s Captain America figure is teasing his time travel plans. A slew of theories have gone public speculating the group’s time-traveling needs. The prevailing idea is that the surviving heroes will need to time travel to prevent Thanos from snapping in the first place. If the group cannot undo the act, they might be able to keep it from ever happening, and that might require a change to The Avengers. After all, if Loki were to never come before Thanos to negotiate over the Tesseract, then there is no telling how the Mad Titan’s snap might be affected. What if this all is a hue?